Ever had the moment where you were standing in front of the wardrobe bursting full of clothes and thinking that you have absolutely nothing to wear out today? I had one too many of such moments, and finally decided to purge my wardrobe – keeping only the pieces I really love and will actually wear. Inspired by an article I read about Capsule Wardrobes (mini wardrobe made up of really versatile pieces that you completely LOVE to wear), I decided to work towards maintaining a minimalist wardrobe instead of continuing to hoard the heaps of clothing I barely wear. Benefits include: Less impulse shopping translating into a healthier bank account and a much neater closet space! It is common for people who hear of my plan to express amazement, disbelief and even eagerness to learn how I managed to reduce my wardrobe to less than 32 items of clothing. So here’s a post documenting how I went about doing so! The very first step of course, is the painful one of getting rid of the clothes you do not really need or wear that is piled up in the deep recesses of your wardrobe. A lot of people I know, myself included, get weirdly attached to our items of clothing that we do not necessarily even wear out. For this I relied on the Marie Kondo method of decluttering. Put all your clothes into a heap of clothing, and start sorting them into two piles – one where it sparks joy and if it does not. For instance, if you’re holding onto a pair of ripped jeans from your secondary school days and it does not make you feel anything holding on to it, dump it. Within an hour, I have bags of clothing ready to be donated away. Repeat this process as many times as you want with your remaining clothes, until you have a small manageable amount. When I first started the capsule wardrobe, I set aside a bag of “back-up” clothes in case the 30 items were not enough, but they were not needed, so they are gone too. Over 6 months I donated more than 10 full bags of clothing to the Salvation Army, sold 2 bags of clothing to Refash (after discovering this wonderful platform), random items on Carousell, and finally I am down to less than 30 items of clothing. 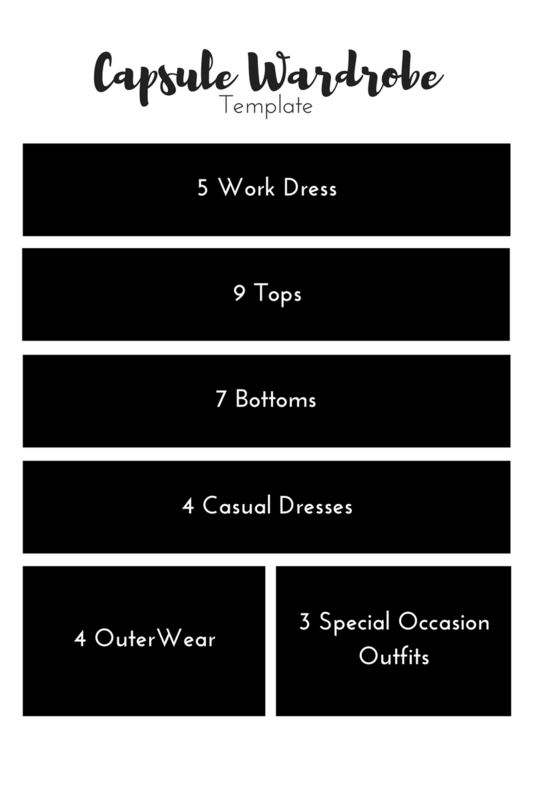 After reading a ton of materials on how other fashion bloggers built up their capsule wardrobes, I worked out a suitable permutation of the various fashion items required in my daily life using the following template (which gives up to more than 70+ outfit variations). Based on this template, I kept what I needed from my existing wardrobe, and bought a few more items to add on to this staple wardrobe. I am still 8 items away from my maximum limit of 32 items but my version 1.0 wardrobe (see below) has been serving me quite well! With outfits that could serve me well for work, casual outings, dates, special occasions and more… I think my credit card will rest easy for the rest of 2017. Rest easy fashionistas. Having a capsule wardrobe does not mean you cannot still keep up with fashion trends. The idea is that even within the capsule wardrobe, you will have your classic staple items (such as your little black dress, white tank top, black t shirt, jeans etc) but the rest should be flexible to suit the up-coming fashion trends. As long as you swap one for one whenever you get a new item of clothing, you will easily be able to maintain the minimalist wardrobe you have always yearned for. This way, your wardrobe will always have only the clothes you will actually wear. I have lived with this capsule wardrobe for about a month so far, and I am eager to continue this as a lifestyle (especially when I move into my new BTO home later this year). Cannot wait to see how my capsule will get updated throughout the year, maybe I will follow up with an update at the end of the year. Are you as inspired? Would you take on the capsule wardrobe challenge?